JUDITH MURRAY SARGENT has more interesting remarks to make about the Bethlehem Seminary in her Letterbook. 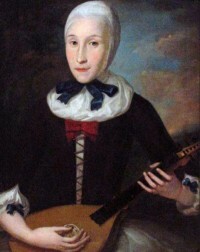 She describes the dress, particularly the caps, of the students and also the sisters who teach them as well as the inhabitants of the town. It is amazing what eronious conceptions are formed of this Seminary—Even at New York, I heard the Gentleman, and the Man of letters, exclaim—“What, immure your Girl with in the Cloistered walls of Bethlehem? 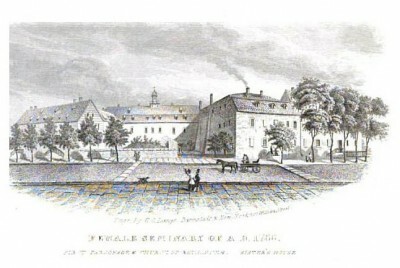 Surely then you do not intend her for society[”]—yet, it is true, that there is no undue confinement, nor restraint—Even the sisterhood make frequent excursions to the adjacent Villages—I have heard much of the awkwardness, and the [immature] heart of the Bethlehem scholar, but I could not trace it in a single instance, and there absolutely is, in their manners an elegant care, and simplicity, which is enchantingly prepossessing—Indeed, dwelling there together, they are constantly accustomed to society, and, it is a fact, that Bethlehem is the resort of the genteelest strangers—It is true dancing is not taught in Bethlehem—but if it be taught proper dancing may be a subsequent acquirement, and a young Lady, designed for the great World, may be very soon initiated into its customs—Mean time, at Bethlehem, she [acquires in her] early days, a good foundation —she will imbibe the chastest system of morals, with a fund of benevolence[,] her mind will be stored, and she will receive almost every embellishment. An exact uniformity in dress is not required—It is a request made to parents, and guardians, that all excess may be avoided, and they are fond of seeing the children in white—The Cap, however, is, if I may be allowed the expression, an insignia of their order— ll the young Ladies put it on — it is made of Cambrick, received a narrow border of Lawn, sets close to the head, and is fastened under the chin, with a pink ribbon—It is of pure white, indeed all the Bethlehem linen is uncommonly white, and although, upon a cursory view, we are induced to think, this same cap could only suit a handsome face —yet, however they manage it, I protest there was not one of the Girls, to whom it did not seem to add a charm—The fashion of the cap worn by the inhabitants, and which, for more than a Century, the Moravian Women have not changed, sets also close to the head but it is a different pattern, and not near so becoming—It is however assumed by every female, of every description—Maids, Wives, and Widows, and, by way of distinction it is fastened by the Maidens, with a red, or pink ribbon by Wives with a blue, and by widows with a white, and this knot of ribbon, is the only ornament worn by a Bethlamite female . . . . In the next post Judith Sargent Murray describes the funeral customs of the Moravians. Bonnie Hurd Smith, the founder of The Judith Sargent Murray Society, has transcribed and published Murray’s letterbooks. See the complete letter HERE. 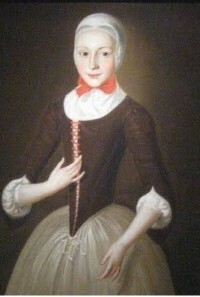 The portrait is of a Young Moravian Girl (1755) by John Valentine Haidt (1700 – 1780). The lacing of the bodice is typical and the cap is as described by Murray.